Please Note: Many publications included here are protected by copyright laws. I provide them for educational use only. Any infringing use may be subject to disciplinary action and/or civil or criminal liability as provided by law. Hover over source title and follow links to publishers for details of permissions of use. Tracy, S. J. (2013). 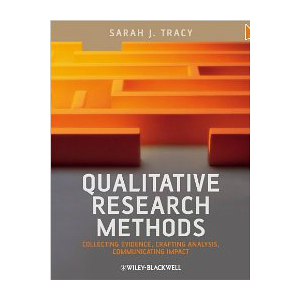 Qualitative research methods: Collecting evidence, crafting analysis, communicating impact. Hoboken, NJ: Wiley-Blackwell. (340 pages). To order and access auxiliary teaching materials, visit here. Reviews available here. Deetz, S., Tracy, S. J., & Simpson, J. L. (2000). 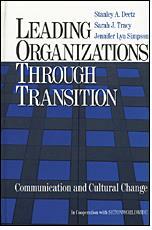 Leading organizations through transition: Communication and cultural change. Thousand Oaks, CA: Sage (232 pages). Reviewed by Barrett, D. J. (2003). Journal of Business Communication, 40, 160-166. Donovan, M. C. J., & Tracy, S. J. (2017). Critical pedagogy meets transformation: Creating the being of communication activists. Communication Education, 66, 378-380. Tracy, S. J. (2016). Practical Application in Organizational Communication: A Historical Snapshot and Challenge for the Future. Management Communication Quarterly, DOI. 10.1177/0893318916675736. Tracy, S. J. (2016). Buds bloom in a second spring: Storying the male voices project. Qualitative Inquiry, 22, 17-24. Scarduzio, J. A., Tracy, S. J. (2015). Sensegiving and sensebreaking via emotion cycles and emotional buffering: How collective communication creates order in the courtroom. Management Communication Quarterly, 29. Tracy, S.J., Franks, T., Brooks, M.M., & Hoffman, T.K. (2015). An OPPT-In approach to relational and emotional organizational communication pedagogy. Management Communication Quarterly, 29, 322-328. Tracy, S. J. (2014). Fieldwork horse-assery: Making the most of feeling humiliated, rebuffed, and offended during participant observation research. Management Communication Quarterly, 28, 459-466. DOI. 10.1177/0893318914536965. Bisel, R.S., Barge, K. J., Dougherty, D. S., Lucas, K., & Tracy, S.J. (2014) A round-table discussion of “big” data in qualitative organizational communication research. Management Communication Quarterly, 28, 625-649. Tracy, S. J., Eger, E. K., Huffman, T. P., Malvini Redden, S., Scarduzio, J. A. (2014). Narrating the backstage of qualitative research in organizations: A synthesis. Management Communication Quarterly, 28, 423-432. doi. 10.1177/0893318914536964. Allen, J. A., Scott, C. W., & Tracy, S. J., Crowe, J. (2013). The signal provision of emotion: Using emotions to enhance reliability via sensemaking. International Journal of Work, Organisation, and Emotion. Malvini Redden, S., Tracy, S. J., & Shafer, M. (2013). A metaphor analysis of recovering substance abusers’ sensemaking of medication assisted treatment. Qualitative Health Research, 23, 951-962. Way, D., & Tracy, S. J. (2012). Conceptualizing compassion as recognizing, relating and (re)acting: An ethnographic study of compassionate communication at hospice. Communication Monographs, 79, 292-315. Tracy, S. J. (2012). The toxic and mythical combination of a deductive writing logic for inductive qualitative research. Qualitative Communication Research, 1, 109-141. Lutgen-Sandvik, P., & Tracy, S. J. (2012). Answering five key questions about workplace bullying: How communication scholarship provides thought leadership for transforming abuse at work. Management Communication Quarterly, 26, 3-47. Alberts, J. K., Tracy, S. J., Trethewey, A. (2011). An integrative theory of the division of domestic labor: Threshold level, social organizing and sensemaking. Journal of Family Communication, 11, 21-38. Alberts, J. K., *Riforgiate, S. E., Tracy, S. J., Trethewey, A. (2011). One more time with feeling: A rejoinder to Wood’s and Clair’s Commentaries. Journal of Family Communication, 11, 60-63. Tracy, S. J. (2010). Qualitative quality: Eight “big-tent” criteria for excellent qualitative research. Qualitative Inquiry, 16, 837-851. Ranked 1 of 22216 articles in Social Sciences Interdisciplinary for 2010 to 2014. LeGreco, M., & Tracy, S.J. (2009). Discourse tracing as qualitative practice. Qualitative Inquiry, 15, 1516-1543. Tracy, S. J. (2008). Care as a common good.Women’s Studies in Communication, 31, 166-174. Lutgen-Sandvik, P., Tracy, S. J., & Alberts, J. K. (2007). Burned by bullying in the American workplace: Prevalence, perception, degree, and impact.Journal of Management Studies, 44, 837-862. Tracy, S. J. (2007). Taking the plunge: A contextual approach to problem-based research. Communication Monographs, 74, 106-111. Tracy, S. J., Myers, K. K., & Scott, C. (2006). Cracking jokes and crafting selves: Sensemaking and identity management among human service workers. Communication Monographs, 73, 283-308. Tracy, S. J., Lutgen-Sandvik, P., & Alberts, J. K. (2006). Nightmares, demons, and slaves: Exploring the painful metaphors of workplace bullying. Management Communication Quarterly, 20, 148-185. Winner, Article of the Year Award, Applied Division, National Com. Association. Tracy, S. J. & Scott, C. (2006). Sexuality, masculinity and taint management among firefighters and correctional officers: Getting down and dirty with “America’s heroes” and the “scum of law enforcement.” Management Communication Quarterly, 20. 6-38. Trethewey, A., Tracy, S. J., & Alberts, J. K. (2006). Crystallizing frames for Work-Life. In the special issue “Communication and the Accomplishment of Personal and Professional Life” in Electronic Journal of Communication, 16:3,4. Tracy, S. J. (2005). Locking up emotion: Moving beyond dissonance for understanding emotion labor discomfort. Communication Monographs, 72, 261-283. Tracy, S. J., & Trethewey, A. (2005). Fracturing the real-self↔fake-self dichotomy: Moving toward crystallized organizational identities. Communication Theory, 15, 168-195. Tracy, S. J. (2004). Dialectic, contradiction, or double bind? Analyzing and theorizing employee reactions to organizational tensions. Journal of Applied Communication Research, 32, 119-146. Tracy, S. J. (2004). The construction of correctional officers: Layers of emotionality behind bars. Qualitative Inquiry, 10, 509-533. Winner, Article of the Year, Ethnography Division, NCA. Used as a model of creative nonfiction in H. L. Goodall, Jr., (2008) Writing Qualitative Inquiry: Self, Stories, and Academic Life. Walnut Creek, CA: Left Coast Press. Used as a model of crystallized epistemological approaches in Ellingson, L. L. (2008). Engaging crystallization in qualitative research. Thousand Oaks, CA: Sage. Tracy, S. J. (2003). Correctional contradictions: A structural approach to addressing officer burnout. Corrections Today, 90-95. Selected and reviewed by editor. Tracy, S. J. (2002). When questioning turns to face threat: An interactional sensitivity in 911 call-taking. Western Journal of Communication, 66, 129-157. Tracy, S. J. (2002). Altered practice<–>altered stories<–>altered lives: Three considerations for translating organizational communication scholarship into practice. Management Communication Quarterly, 16, 85-91. Tracy, S. J. (2000). Becoming a character for commerce: Emotion labor, self subordination and discursive construction of identity in a total institution. Management Communication Quarterly, 14, 90-128. Tracy, S. J., & Tracy, K. (1998). Emotion labor at 911: A case study and theoretical critique. Journal of Applied Communication Research, 26, 390-411. Tracy, K., & Tracy, S. J. (1998). Rudeness at 911: Reconceptualizing face and face attack. Human Communication Research, 25, 225-251. * Asterisk (*) denotes a co-author who was a student I mentored when material was developed. *Razzante, R. J., Tracy, S. J., & Orbe, M. P. (In Press). How dominant group members can transform workplace bullying. In R. West & C. Beck (Eds. ), The Routledge handbook of communication and bullying (pp. 46-56). New York, NY: Routledge. Tracy, S. J., & Donovan, M. C. J. (2018). Moving from practical application to expert craft practice in organizational communication: A review of the past and OPPT-ing into the future. In P. J. Salem & E Timmerman (Eds. ), Transformative Practices and Research in Organizational Communication (pp. 202-220). Hershey, PA: IGI Global. Tracy, S. J. & *Hinrichs, M. (2017). Big tent criteria for qualitative research. In J. Matthes, C. S. Davis, & R. F. Potter (Eds.) The International Encyclopedia of Communication Research Methods (134-143). Hoboken, NJ: Wiley-Blackwell. Tracy, S. J. & *Hinrichs, M. (2017). Phronetic iterative data analysis. In J. Matthes, C. S. Davis, & R. F. Potter (Eds.) The International Encyclopedia of Communication Research Methods (1444-1451). Hoboken, NJ: Wiley-Blackwell. Tracy, S. J. (2017). Burnout in organizational communication. In C. Scott and L. Lewis (Eds.) The International Encyclopedia of Organizational Communication (pp. 166-174). Hoboken, NJ: Wiley-Blackwell: Wiley Publishers. (4,000 words). Tracy, S. J., & Malvini Redden, S. (2016). Markers, metaphors, and meaning: Drawings as a visual and creative qualitative research methodology in organizations. In K. D. Elsbach, and R. M. Kramer (Eds. ), Handbook of qualitative organizational research: Innovative pathways and ideas (pp. 238-248). New York: Routledge. Tracy, S. J. (2014). Emotion and communication in organizations. In W. Donsbach (Ed. ), Concise International Encyclopedia of Communication. Hoboken, NJ: Wiley-Blackwell. Lutgen-Sandvik, P., Tracy, S. J., & Alberts, J. K. (2013). Prevalence, perception, degree, & impact of adult bullying in the American workplace. In P. Lutgen-Sandvik (Ed. ), Adult Bullying—A Nasty Piece of Work (pp. 12-33). St. Louis, MO: ORCM Press. Tracy, S. J., & Geist-Martin, P. (2013).Organizing ethnography and qualitative approaches. In D. Mumby and L. L. Putnam (Eds. ), Sage handbook of organizational communication, 3rd ed. (pp. 245-270). Thousand Oaks, CA: Sage. Rivera, K. D., & Tracy, S. J. (2012). Arresting the American dream: Patrolling the borders of compassion and enforcement. In S. May (Ed. ), Case studies in organizational communication: Ethical perspectives and practices, 2nd ed. (pp. 271-284). Thousand Oaks, CA: Sage. Tracy, S. J., Alberts, J. K., Rivera, K. D. (2009). How to bust the office bully: Eight tactics for explaining workplace abuse to decision-makers. In A. Varma (Ed. ), Understanding and addressing workplace bullying. Andhra Pradesh, India: ICFAI University Press. White paper from which it developed available here. Tracy, S. (2009). Managing burnout and moving toward employee engagement: A critical literature review and communicative approach toward reinvigorating the study of stress at work. In P. Lutgen-Sandvik & B. Davenport Sypher (Eds. ), The destructive side of organizational communication: Processes, consequences and constructive ways of organizing (pp. 77-98). New York: Routledge. Planalp, S., Metts, S., & Tracy, S. (2009). The social matrix of emotion expression and regulation. In C. Berger, (Ed. ), Handbook of communication science, 2nd edition (pp. 363-379). Thousand Oaks, CA: Sage. Tracy, S. J. (2009). Navigating the limits of a smile: Emotion labor and concertive control on a cruise ship. In J. Keyton & P. Shockley-Zalabak (Eds. ), Case studies for organizational communication: Understanding communication processes, 3rd edition (pp. 282-292). Los Angeles: Roxbury Publishing. Stewart, K. A., Hess, A., Tracy, S. J, & Goodall, H. L. (2009). Risky research: Investigating the “perils” of ethnography. In N. K. Denzin & M. D. Giardina (Eds. ), Qualitative inquiry and social justice (pp. 198-216). Walnut Creek, CA: Left Coast Press. Tracy, S. J. (2009). Organizational Culture (2,300 words). Encyclopedia of communication theory. Thousand Oaks, CA: Sage. Tracy, S. J. (2008). Emotion and communication in organizations. International communication association encyclopedia. (pp. 1-7). Hoboken, NJ: Wiley-Blackwell. Hess, J. A., & Tracy, S. J. (2008). Finding your first job: The job search and interviewing process. In S. Morreale & P. Arneson (Eds. ), Getting the most from your graduate education in communication: A student’s handbook. Washington, DC: National Communication Association. Tracy, S. J. (2007). Power, paradox, social support and prestige: A critical approach to addressing correctional officer burnout. In S. Fineman (Ed. ), The emotional organization: Passions and power (pp. 27-43). Oxford: Blackwell. Tracy, S. J. & Scott, C. (2007). Dirty work and discipline behind bars. In S. Drew, B. M. Gassaway, & M. Mills (Eds. ), Dirty work (pp. 33-54). Waco, TX: Baylor University Press. Scott, C., & Tracy, S. J. (2007). Riding fire trucks and ambulances with America’s heroes. In S. Drew, B. M. Gassaway, & M. Mills (Eds. ), Dirty work (pp. 55-76). Waco, TX: Baylor University Press. Tracy, S. J. (2003). Watching the watchers: Doing ethnography behind bars. In R. Clair (Ed. ), Expressions of ethnography (pp. 159-172). Albany, NY: SUNY Press. Giannini, G. A., & Tracy, S. J. (2011). Communication resolutions for 2012: Gratitude. Communication Currents, 6:6. The Web Magazine of The National Communication Association. Tracy, S. J. (2010). Compassion: Cure for an ailing workplace? Communication Currents, 5:6. The Web Magazine of The National Communication Association. Tracy, S. J. & Rivera, K. D. (2009). Work Hard, Live Hard. Distributed to work-life organizations, their websites, and media outlets internationally. Tracy, S. J., Alberts, J. K., Rivera, K. D. (2007). How to bust the office bully: Eight tactics for explaining workplace abuse to decision-makers. Distributed to workplace bullying websites, and media outlets internationally. Scott, C. W., Myers, K. K., & Tracy, S. J. (November, 2006). Humor as Serious Business. Communication Currents, 1:1. The Web Magazine of The National Communication Association. Ironman Triathlon Race Report – Arizona – November 23, 2008 – Sarah J. Tracy.